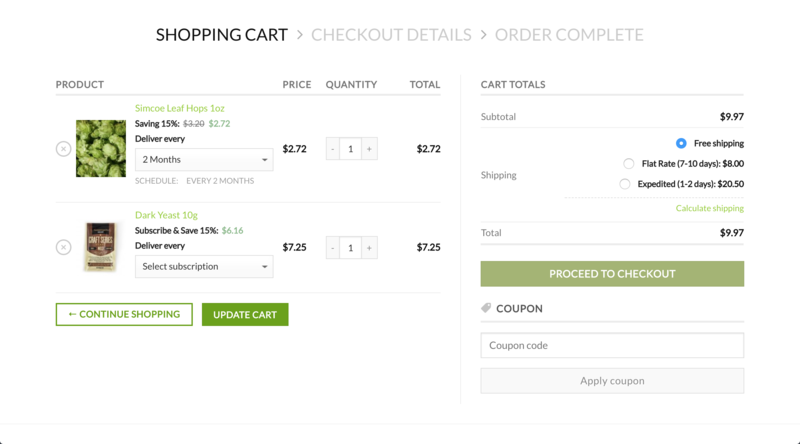 Autoship Checkout Price($) is the price that is offered at WooCommerce cart/checkout when a product selected for Autoship is added to the cart. Autoship Recurring Price($) is the price that is offered for the product on recurring Scheduled Orders. Note: both of these prices are optional to offer. If no Autoship Checkout Price or Autoship Recurring Price is provided, the WooCommerce Regular Price for the product or variation will be used for checkout as well as recurring Scheduled Orders. If both Autoship Checkout Price and Autoship Recurring Price are set to the same value, then the price is simply displayed as "Autoship and Save x%". The Autoship Cloud plugin will automatically calculate the % percentage savings by comparing the WooCommerce Product's Regular price to the Autoship Checkout Price. Note: If you would like to calculate the % percentage savings for all WooCommerce Products, you can perform a bulk update of the Autoship Checkout Price within Wordpress Admin > Autoship Cloud > Migrations. The order frequencies presented are defaulted to 1, 2, 3, 4 and 5 months. These are simply the most popular default frequencies used by Autoship Cloud stores. If you would like to customize this global default, you can edit the plugin directly and change these frequencies. Learn more about how to change the default frequency options here. If you would like to customize the frequency options for any given product or variation, you can do so on that product's Product Settings page, under the Autoship tab. Learn more about Autoship Product Settings here.